Hand-written notes mean so much. ​Below is a sample letter that you may use or adapt to say "thank you" to Governor McAuliffe. 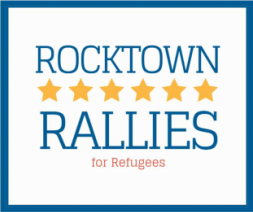 I am a member of Rocktown Rallies, a group of concerned Harrisonburg residents who are trying to make a difference in the Syrian refugee crisis. I am writing to let you know that we are proud of our Commonwealth, and proud of you as our Governor for your continued support of Syrian refugee resettlement. Keeping Virginia open to Syrian refugees is the right thing to do. Thank you for rejecting cruelty and fear-mongering in favor of compassion, the rule of law, and human rights.